Known as Abu ‘I-Quasim Firdausi Toosi or just as Firdausi, he was a Persian poet and gained fame as the author of Shahnameh. He has the distinction of being the sole composer of the world’s longest epic poem consisting of about 60,000 couplets written in early modern Persian and even longer the Illiad and Odyssey. Shahnameh literally means the name of kings. In his work which took 35 years to complete he covered the entire gamut of Persian history beginning with the creation of the world till the complete takeover of Persia by the Arab invaders. The Shahnameh is an impressive monument of poetry and historiography. It is essentially the poetical recast of what Firdausi and his predecessors regarded as the account of Persia's history. Three main dynasties of Persia were covered by Toosi. They were the Peshdaad, Kayaan and Sasanid. Toosi was a person with outstanding ethical values and emphasized the avoidance of all negative human attributes and championed high human values for the upliftment of humankind. He lived for 80 years (940-1020 AD). Commissioned by the King, to undertake this humongous epic, he worked on it with all the passion in him but died heart-broken due to the measly amount that he was paid for this monumental task. Though the king tried to recompense him for the shabby treatment meted out to him by sending him gold coins and other gifts, it was too late in the day. His daughter with the little money Toosi had earned built a memorial for her father in his native village. Adi Merchant has done an outstanding job of bringing alive the history of Persia to the present generation in his latest book. When Adi sent the book to me, I had strong reservations of reading a book on Persian history and I thought that I would be better off reading more about our own Indian history. After reading the first few pages on a flight, the book literally gripped me and then I ended up reading page to page with great excitement and suspense. Written in a simple and lucid style, the author has taken great pains to undertake extensive research to chronologically trace the rise and fall of what was a great empire in the annals of human civilization. The book traces the Persian history from the time of Kaiomars who founded the Persian nation and from then onwards the succession of kings and queens have been graphically portrayed by the author for their military strengths, nobility, pride, egos, weaknesses and their final annihilation. The battle scenes have been so realistically depicted in the book by the author that I felt that I was watching the dramatic battles and wars in reality. Some kings like Jamsheed played God, Faridoon was a just and generous king, Minuchehr was kind and munificient, Naudar was cruel, Kai Kaus proud and foolish and the unforgettable Rustom and Sohrab saga, which all of us must have heard about in our younger days was thrilling to read. Kai Khusru, Lohrasp, Gushtasp, Bahman, Humai the first queen of Iran, Darab, Dara and Sikandar (Alexander the Great), Khosroes, Nooshirwan and Mazdak, and it was Khusraw Parwiz who had the misfortune of presiding over the beginning of the end of the great Persian dynasty caused by the invasion of the Arabs. Finally, the roaming King of Iran, Yazdigird III fled to Khuraasaan and he was killed in 652 AD. Thus ended the saga of the Shahanshas on a most tragic note. The main message that the Shahnameh of Firdausi tries to convey is the idea that the history of the Persian Empire was a complete and continuous whole; it started with Kaiomars, founder of the Persian nation, and ended with his fiftieth scion and successor, Yazdigird III spanning over nearly six thousand years of history of Persia. Firdausi took upon himself the enviable task to prevent this history from being lost to future Persian generations. It is largely his effort to preserve the memory of Persia's golden days and transmit it to the younger generation so that they could learn and try to build a better world. Adi Merchant must be complimented for the excellent work he has produced for the younger generation not so familiar with Persia’s ancient history. I strongly recommend this book to them. It is a monumental and majestic work on the history of Persia and narrated very fascinatingly. I had to often go back many pages and come forward again to keep my mind in sync with the author’s pace. The book has several interesting sketches and colour pictures of the emperors which enrich the book further. We in India know how the Zorastrians who fled Persia due to the persecution by the Arabs landed on our West Coast at Sanjana in the 8th century and continued to keep their faith in Ahura Mazda and also have kept the holy fire unextinguished. Known as Parsis (from Persia), they continue to contribute immensely to India which they have adopted as their own. Shashi Tharoor, Member of Parliament, needs no introduction to book readers. He is a prolific author of books. This is his seventeenth book. Neatly divided into three sections, almost the first one-third of the book is about his own belief in Hinduism, the Hindu way of life and its various customs with a full chapter devoted to the great souls of Hinduism. In the first chapter of the first section, he explains the title of the book. His Hinduism is one of a lived faith. It is the oldest religion in the world (Sanatana Dharma) with around 1250 million people as followers all over the world. It includes an eclectic range of doctrines and practices which includes pantheism (multiple divinities) as well agnosticism and even atheism. It believes in rebirth and a caste system. To be a Hindu you are not obligated to any doctrine and you don’t have to have a belief in a God. Hinduism has a long history from time immemorial and a common culture and tradition throughout the vast country. What also attracts Hinduism to Tharoor is lack of dogma and freedom to choose one’s way of life from a broad canvas of options. So majestic and yet modest are the Vedic Seers that Tharoor quotes the Naasadiiya Sooktham or Hymn of Creation- part of the three millennium old Rig Veda “who knows whence this creation had its origin? --- He knows---or maybe even He does not know”. Tharoor compares Hinduism to a huge banyan tree under whose shade, men and women, plants and animals, thought and action flourish. Tharoor highlights in Chapter 4, the immense contributions to Hindu philosophy made by Adi Shankara and Ramanuja who restored “Hinduism to pre-eminence and popularity as the principal religion of India”. Tharoor takes the readers on an illuminating journey through the maze of Hinduism. He quotes extensively from the Vedas and Upanishads, guides them through myths and popular practices, elaborates the thoughts of prominent expounders, and tells us about his own religious practices. In the second section of the book, he chronicles the making of Hindutva. How it distorts Hinduism and how it can damage the social fabric of our country. He concludes that Hindutva as politics simply does not adhere to the precepts of Hinduism. It is basically incompatible with Hindu religion and faith. It seeks control and power over society. Hindutva is not concerned with the nuances of Hinduism, its agenda is to galvanise the Hindu community to quench its thirst for power unlike Hinduism which shows the path to personal salvation. The last chapter and last section of the book is devoted to taking Hinduism away from the clutches of Hindutva proponents who at the cost of the minorities are converting a pluralist religious philosophy into a political ideology. One of the distinct features of Hinduism is that there has never been any attempt by any individual or any organization to spread the religion or establish it as an element of identity of people. As a result, the philosophy of Hinduism and the prescriptions of moral living are applicable to anybody irrespective of the religious belief the person might follow. Swami Vivekananda had said that Hinduism stands for both tolerance and universal acceptance. Any such move to change the character of Hinduism would be dangerous and would destroy India argues Tharoor. Tharoor believes that Hinduism is almost the ideal faith for the 21st century and a universal religion. No apostasy, no heresy. It is eclectic, has no dogmas and is therefore best suited to the uncertainties of a post-modern world. Tharoor is a proud Hindu and a non-Hindutva Hindu. “ Garv se kaho ki hum Indian hein” is his motto. Dr. Raghavachari Srinivasan is a renowned banker having served the banking industry for more than four decades. He retired as Chairman and Managing Director of Bank of India. He started his banking career as a clerk at National Bank of India, Chennai in 1949. Later in 1960, he joined Andhra Bank to set up their foreign exchange department and worked at Hyderabad and Chennai. While in Andhra Bank, he was sent for specialized training in foreign exchange to Deutsch Bank, West Germany and West Minister Bank, UK. In 1971, he joined New Bank of India, New Delhi, as Controller of foreign exchange and rose to be their Chairman in 1981. He took over as Chairman and MD of Allahabad Bank, Kolkata in 1982 and in 1987 he was appointed CMD of Bank of India. He retired in 1991. He was also Chairman of the Indian Banks’ Association (IBA) during the years during this period. His spectacular rise in the banking industry was literally from the Log Cabin to the White House. 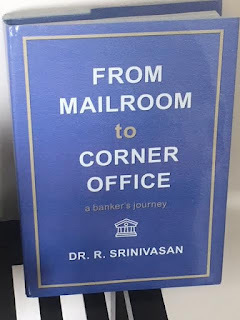 Urged by his son Srikant Vasan in 2005 to write his autobiography, Dr. Srinivasan agreed to embark on this journey to record his fascinating life from humble beginnings in a remote village in Tamil Nadu to the apex of power in the country’s banking industry. In his mid-seventies then, aided by his remarkable memory, he started writing this book primarily for the benefit of his large family of multi-generational members and dear friends from a wide circle in the banking industry and outside. He joined a Facebook group of present and past employees of Bank of India called “Galaxy of Bank of India Stars”. Over a year, he had posted in Facebook about his various experiences during his illustrious banking career which added the right “masala” to his writings on his early life to make his book a very delightful read. What emerge from the book are the characteristics of a person of great integrity, honesty, a dear family man, a thorough professional and an outstanding leader and banker. He excelled in indoor games both carom and chess. A role-model for the old and younger generation in general and aspiring professionals in the banking industry in particular- an industry which he led with remarkable success. Current and potential leaders of the banking industry can learn many lessons from Dr. Srinivasan’s accounts of his wide ranging experience as a specialist in foreign exchange and his interactions with the topmost echelon of different banks in which he worked as well as with colleagues and Union leaders and Unionized staff. The way he handled militant Unions is an object lesson for all professional managers. Dr. Srinivasan’s writing is candid, transparent and his views brutally frank. He had his early education in nondescript schools in Vembanoor and Ohai villages, in Thanjavur district, Tamil Nadu. Over the years, he studied while working and obtained graduate and post graduate degrees. Post- retirement, he obtained a Doctorate from Bombay University in 1992 on “Priority Sector Advances- An Overview” at the age of 73. This thesis was later published as a book and dedicated to Late Sri C Rajagopalachari, the first and only Indian Governor General of India for whom he has described his unabashed respect. After covering his early days in his village and giving a glimpse of his personal life to the readers, Dr. Srinivasan narrates his various roles in the banks that he worked with. To begin with, he was an active member of the Bank’s employees’ union in National Bank and participated from the front in a 13 days first-ever bank strike. Undoubtedly, these experiences helped him to play an effective role in handling Union intransigency as CEO of the Allahabad Bank and later as CMD of Bank of India. He established a personal rapport with many of his staff and Union leaders who respected him for his humane approach. He took the Unions head-on when required and demonstrated his courage, tenacity, persuasive ability and conviction and found satisfactory solutions to difficult problems. Needless to say, the staff found in him a person of extraordinary qualities of head and heart. A leader who was just and fair in his dealings with one and all. They demonstrated their respect to him in many ways. Sadly, there was an aberration in Dr. Srinivasan’s life post retirement. False charges were foisted on him by CBI in 1994 and he had to suffer the ignominy for many years. Justice system in India moves at snail’s pace. As it is said, justice delayed is justice denied. Dr. Srinivasan was put through severe mental torture and trauma till he finally obtained relief in 2007 and was acquitted by the Court of all charges. He covers this phase of his stressful life under the chapter “Challenging Times”. The book is extremely readable and appealing. It is written in a simple style (the author has a reputation for an excellent handwriting) with interesting incidents and episodes and charming anecdotes including innumerable colour photographs taken during the many foreign and domestic holidays that he enjoyed with his family members after retirement. The accounts of his short meetings with political bigwigs are a treat to read. The last chapter on his meeting with Col Rai, Vir Chakra, of the Indian Army brings out the author’s love for his motherland and admiration for the unflinching battles that the soldiers fight for preventing any intrusion into the country’s borders and for the safety of our people. There are many pages in the book that should be read by the younger generation to understand and imbibe the basic values of life and how integrity, conscientiousness, honesty, hard work and discipline can take one to the pinnacle of one’s career. Equally, there are object lessons for elders who can learn the art of productive ageing in their twilight years from octogenarian Dr. Srinivasan. Besides, his steadfast support for his wife Sulochana during thick and thin and who he considers as his conscience keeper and pillar of support, his graceful acceptance of different cultures in his large family and integrating every one as an important unit exemplifies Dr. Srinivasan’s tolerance, magnanimity and farsightedness. The octogenarian author is the great great granddaughter of Sir T Madhava Row (1828-1891). A medical biologist by profession, Urmila Rau Lal has extensively worked in the field of scientific research in prestigious institutes in India and abroad and has won many fellowships in her field of parasitology and medical entomology. She takes active interest in the Senior Citizens’ movement in Pune and has been working at various fora to provide special conveniences for the older as well as differently abled people in the country. Inspired by her late father Captain Ramchandar Lakshman Rau (Retd.) to write a biography on an extraordinary ancestor, she fulfilled her father’s wish by writing this biography for which he had painstakingly gathered a lot of information. It is but natural that she has dedicated her work of love to her parents. From Travancore he moved on to Indore (1873-1875) and from thereon to Baroda (1875-1882). In both these states as Diwan he carried out his “development model” and introduced major administrative, police and judicial reforms. He campaigned for the cause of women’s education and attacked child marriage. The author has given numerous examples of his intellectual brilliance, decision making capabilities, his art of maintaining a fine balance between the Maharaja and the British by using his mastery of the English language and his capacity to convince the British on the King’s viewpoints on many ticklish issues. This raised his respectability in front of their eyes. Sir T Madhava Row was a man of head and heart. He was popular with the masses for his honesty and integrity and for cleansing the States of all forms of corruption and undesirable elements. His Western style education was largely instrumental for his modern ideas. He left behind an indelible impression in the minds and hearts of people he came across. In addition to his many achievements, Sir T Madhava Row also had several other feathers in his cap. His fondness for music resulted in the formation of a Gayan Samaj in Poona. He had earlier actively participated in the formation of a similar branch in Madras 1883. He maintained a very cordial relationship with Christian leaders and educationists. We owe a sense of gratitude for this biography to the author for having taken immense pains and for her interactions with various generations of families who had known Sir T Madhava Row and to give the readers a full-blown account of the outstanding qualities of this remarkable administrator and reformer. The book is interesting from the perspective of Kerala’s history and the turnaround achieved in the State in all areas of human activity. Development with good governance were the hallmarks during Sir T Madhava Row’s tenure which he accomplished with his extraordinary language skills, administrative abilities, an empathetic attitude and a high degree of personal integrity, dedication and commitment for the development of the State and a sense of fair play. There are many anecdotes and nuggets of information in the book which make it very readable. In Appendix V of the book, Sir T Madhava Row’s ‘Rules for the Ruler’ (twenty five of them) which he prepared after the death of Maharaja Visakham Tirunal, are given which are as relevant today as it was then. This book is a recommended read for the nation’s youth and all who join the administrative service. A series of his lectures addressed to the young King of the state of Baroda in the form of a publication called “Minor Hints” is a reference manual even today to the State Government. His phenomenal achievement as Diwan of the three States he worked for in his illustrious career is an object lesson for the younger generation and in particular for all our budding IAS officers. Padma Lakshmi is a famous television host and a successful cookbook author. She is also a well-known fashion model and jewelry designer. She runs a Nonprofit organization for women affected by endometriosis which she founded along with her doctor and savior, Dr. Tamer Seckin in 2009.The Endometriosis Foundation of America (EFA) is dedicated to combating endometriosis through advocacy, focussed research, education, and increasing awareness. The experience of having travelled across the globe from a young age which added to her passion for cross -cultural food makes her a winner for every book that she writes on cooking. Her earlier book was also on the New York Times Best Seller list. Her reality show Top Chef running for fourteen seasons bagged the Emmys award in 2016 where it was nominated for Outstanding Reality Competition Programme. This is the multi-hyphenate talent Padma Lakshmi’s fourth book. Padma writes that from early childhood she was fascinated with spices and herbs. Growing up with her grandparents in Kerala, she spent considerable time in the family kitchen watching her grandmother use the locally available spices to delirious effect. Thus the seed of interest in the wonderful flavours of different spices and herbs got planted in her formative years which now is in full bloom as a well grown plant and offering to the readers of her illuminating books access to a wide knowledge of this subject literally from A to Z. This reference book does exactly that. It is an alphabetic compendium of magical ingredients like salts, peppers and of course spices and herbs both familiar as well as obscure which come together from all over the world. She provides the correct botanical name of each ingredient with an in-depth and informative description which makes it comprehensive and scientific. She also provides medical information on how some of the spices can give relief from attacks of asthma, urinary tract infection, etc. Such a diverse range of spices adds the extra attraction to the book. The book has very richly coloured pictures that give the reader a good look, smell and feel for the fascinating flavours that eventually emanate in the end product which is both healthy and delicious. The book has no recipes. But it has suggestions as to how the best dishes can be prepared with an intelligent use of the most unbelievable and exotic seeds and chillies. Her fond attachment to Kalustyan’s, a gourmet food store in New York City, is because of the early exposure that she received in global cuisine. Running around the shop as a young girl, she picked up the aroma and flavor of spices and herbs stocked up from all over the world in this iconic store. Be it South Indian sambhar powder or the mid-east Sumac or Szechuan peppercorns the book has all of them. An interesting fact that the author points out is that are so many similar cuisines throughout the world. A well-researched and beautiful encyclopedia, co-authored with Judith Sutton also a cookbook author and cookbook consultant, it is a welcome addition to a plethora of books on this genre. Though the book aims at a select audience, it would be of great value to the large libraries the world over. Padma writes lucidly and in a simple and attractive and endearing manner drawing the readers’ attention and keeping it focused without dithering or drifting from the subject. The author does not limit herself to the title of the book. She provides information of the various accoutrements like vinegars, oils, etc which amplify the taste of the food and as well as on toasting spices and preparing tea. Of course, one does not read the boo in one go because it is used for reference. But then the presentation and the information grips the attention of the reader who gets encouraged to read more and more. It is a must read for all cooking buffs as well as well established Chefs. It will help the newcomers from cooking mundane stuff to a high level of eclectic food. It gives them a panoramic and exciting tour of this whole class of plant kingdom which benefits them as a resource and gives them all the pleasures of an exciting adventure which starts from ‘advieh’ and ends in ‘zedoary’. I just completed reading an extraordinary book written by Dr. Jay Lombard, a renowned and internationally acclaimed neurologist. I immediately decided to share my review of the book with readers of Dignity Dialogue. Dr. Lombard is the co-founder and developer of Genomind, a personalized medicine company for brain health which utilizes genetic testing to improve neuropsychiatric conditions, including Alzheimer’s, Autism, and Depression. Dr. Lombard’s discoveries have been regarded by key opinion leaders as fundamentally shifting the paradigm of psychiatric medicine. He is considered by those who know him intimately as “part Freud, part Sherlock Holmes.” He served as Chief of Neurology at Bronx Lebanon Hospital in New York, and currently is in clinical practice in Manhattan. He has appeared as a guest on many TV programmes including Larry King Live and CBS News. He is well known for his compassion and commitment to his patients and has received multiple honours as a top neurologist in New York. For me it was a great journey into the far depths of the mind and to experience how Dr. Lombard has tried to reconcile the doubts and beliefs that lie at the interface of religion/faith and science. He has addressed this subject in a very compelling and convincing manner. Science is science and Faith is faith and the twain shall never meet. Is that true? Or can both meet on a common ground when the physical and the metaphysical come very close to the answer to the question- Is there truly a God? * Do human beings have souls? * Are human any different from other animals? * Do we have free will or is life predetermined for us? * Is there a meaning for life, and is there a higher purpose to human existence? 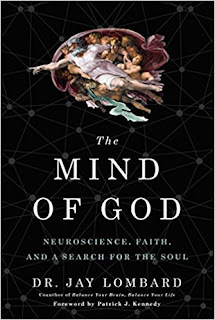 The author uses remarkable case studies from his own extensive neurology practice to prove the dominant role that faith plays in sustaining life. Neuroscience helps us to learn how our brains interpret reality and how this could result in more satisfying and fulfilling lives. Though most neuroscientists insist that beyond the flesh there is no physical evidence of existence and that the concept of a soul is nothing but an illusion, Dr. Lombard begs to differ. There are gaps in conventional scientific thinking referred to as the “hard problem of consciousness” which refers to the grey zone between “tangible senses and the supra-sensory experience we have of them.” Consciousness is a gift which enables human beings to inquire about the meaning of existence, says Dr. Lombard. There is hidden deep inside us a ‘deeper, intrinsic and fascinating reality”. Call it mind, soul or energy it is irreducibly complex and basic to our existence. Dr. Lombard argues that with science, faith and reasoning we can surely see something beyond and what we see will be extraordinary. We have to understand how the biological and transcendental can complement each other positively and strike a balance as we need both not either/or. With several case studies as examples Dr. Lombard admirably conveys his thinking that through our beliefs and actions we manifest God’s otherwise unknowable reality. We are all divine sparks of “not merely a piece of the entire existence, but in a certain sense the whole.” Our existence is because of God and He exists in tangible ways through us. Our faith can be seen in our deeds, our love and our caring for each other. Our understanding of God is not to promote separation or fighting among ourselves. He has knit us all together in love. And it is in this love that we become immortal. “I DO WHAT I DO”: RAGHURAM G RAJAN: HARPER BUSINESS: PAGES 323: PRICE: RS 699. 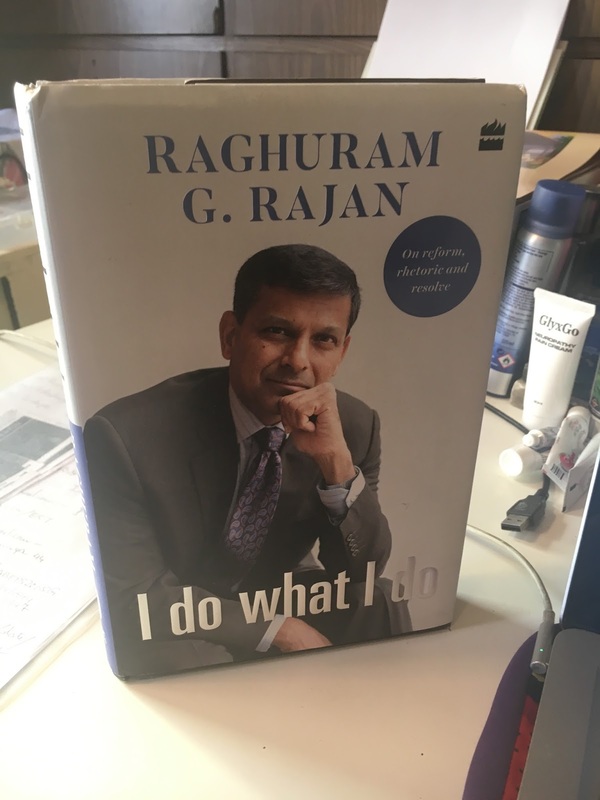 Just a year after his term as Governor of the Reserve Bank of India came to an end, Raghuram Rajan’s book “I do what I do” which is a collection of his talks, lectures, and commentaries conveying what it was like to be as the head of the central bank was published. He confirmed during his tenure his reputation of a first class economist and banker and one who articulated his views both in private and public in a bold and convincing manner during his short stint as Governor of the Reserve Bank of India. The Indian economy was in dire straits when he arrived on the scene. The rupee was in free fall, inflation was high and mounting. The current account deficit had shot up and importantly India’s foreign exchange reserves were frightfully falling. Many attempts to reign in an economy in serious trouble had failed. And more problems were in store. A full-blown crisis was expected by keen market watchers. Suddenly, a strong economy had become one of the world’s five fragile economies. Stepped in Raghuram Rajan. He immediately went all out to bring the confidence back into the market. Besides very successful short term actions, he outlined a long term plan for growth and stability. He emphasized the strength of India’s financial institutions and exhibited his mastery over the problems to take the reforms already instituted successfully forward. Whether it was unemployment, inflation or bad loans he took all of them head on. NPAs (Non performing Assets) and bad loans had become a major issue. Raghuram Rajan showed exemplary clarity in dealing with the ‘bad-loans’ problem. He emphasised the importance of “early recognition of distress and fair treatment of lenders and borrowers.” In his opinion Central Bank’s policy must be tuned to “help those with difficulty while being firm with those trying to milk the system.” In this process, he dwells on the relationship with the bureaucracy and its attempts to clip RBI’s wings. He warned against reckless lending and he launched during the end of his tenure in September 2016, the Asset Quality Review in order to compel banks to square their books of accounts. He was unfairly criticized for a slowing of credit from the public sector banks leading to a slowing down of the economy. Financial inclusion is one of Raghuram Rajan’s pet subjects. It needs a revolution. With over 900 million mobile phones, there is a huge opportunity for mobile banking. And technology with its capacity to reduce transaction costs can greatly help in large volume low-ticket transaction which is at the centre of financial inclusion..“ Despite the high return from the delivery of credit to the poor, and despite much of our financial inclusion efforts focused on credit, we still reach too few of the target population. So there is much more to be achieved”. There are many other topics of interest which Raghuram Rajan has covered in this book. How distress in the banking system can be resolved, how international issues could impact our economy and the last global financial crisis which he had predicted. One strength of Raghuram Rajan that comes out in the book is his human relations. He was extremely supportive of the people who worked for him. He had great regard for all the employees of RBI and constantly motivated them to perform better. The love and regards that they reciprocated were demonstrated when he bid farewell to them. His speeches and commentaries show his mastery over the subject and he makes them understandable to the audience. No graphs or charts. There is not much of economic jargon or sermonizing. It is clear, lucid, refreshing, frank and bold. One gets an overview of our economy, the challenges ahead and how it should be tackled by the Central Bank in conjunction with the Government. Jollof rice is an unique African delicacy relished at every important event literally from the cradle to the grave. It is craved by all Africans young and old alike. 22nd of August is World Jollof Rice Day. The name Jollof owes its origin to the Wolof tribe who live in Gambia and Senegal. Though originally Jollof rice started as a fish-based recipe, the chicken garnished Jollof rice has gained greater popularity. Both enjoy unparalled adulation throughout the African continent. 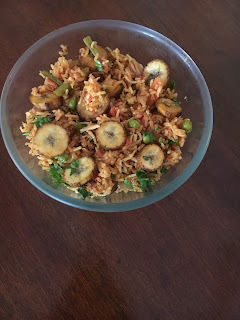 I was surprised to know that plain seasonal vegetables are used to make a stew and mixed with basmati rice and tomato sauce to prepare a vegetarian Jollof rice. Jollof rice is normally avoided in the mornings. It is taken at dinner time. Tomato sauce dominates the various spices and herbs that are added to give it a special flavour and it gives this popular dish its distinctive redness. Even palm oil and tea bush leaves are added to give Jollof rice a very special aroma. 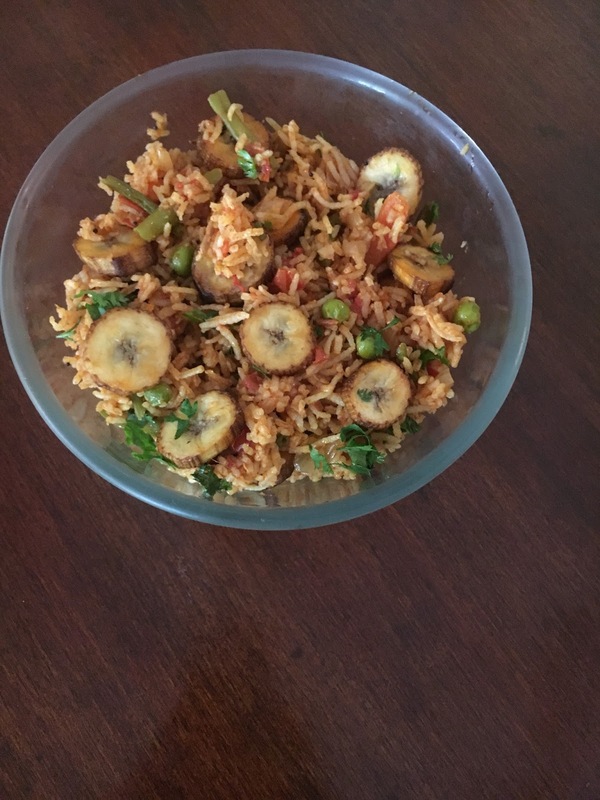 I decided to have this dish prepared at home and asked my cook whether she was ready to experiment with a new dish. She happily agreed and what you see in the picture below is the result of my encouragement and her efforts. Needless to say that I enjoyed eating Jollof thoroughly and it was then that I realised why this culinary king has become a national obsession in Africa. 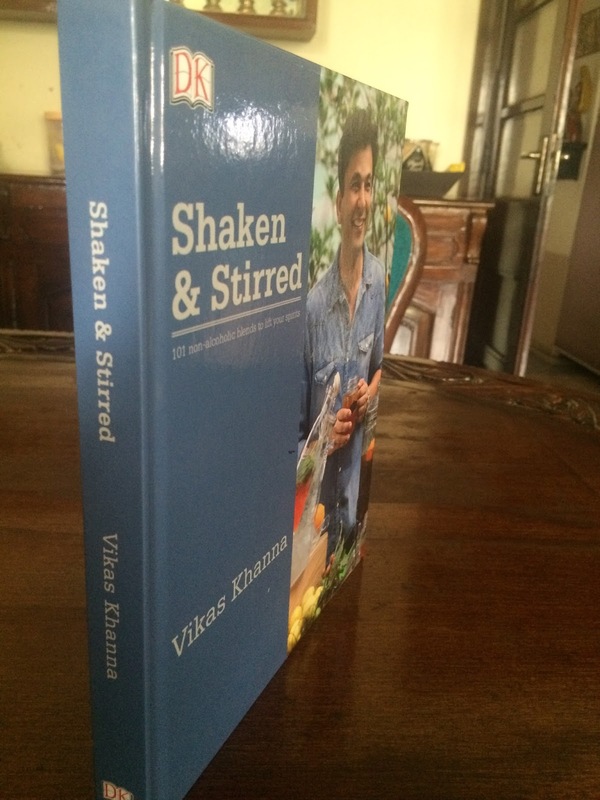 Chef Vikas Khanna’s latest book, “Shaken and Stirred” promises to “refresh, soothe, revive and energise”. It delivers on its promise. “Unlike the rest of the world, India has a lot of non-spirited drinks. We all have vivid memories of our comfort drinks. For me, it was warm milk, scented with cardamom, sometimes garnished with almond slivers,” says Khanna. Vikas Khanna is an award-winning, Michelin starred Indian chef, restaurateur, food writer, filmmaker, humanitarian and the host of the very successful TV show MasterChef India. He was also the host of another well-received television programme – Twist of Taste – on Fox Traveller. Vikas Khanna is based in New York City. “Shaken & Stirred” is a dazzling collection of non-alcoholic drinks, including some timeless classics and exciting modern recipes with a smorgasboard of delectable options. These drinks do not take much time to make and yet taste so good. 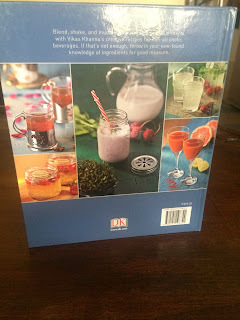 These versatile recipes allows one to play with one’s imagination and create drinks for any occasion, while keeping the pure flavour and wholesome goodness of the ingredients intact.The book gives a methodical and step-by-step recipes for creative drinks for different times and occasions. Easy to put together, these recipes clearly indicate the time taken, number of persons who can be served and also special equipment required, if any. The recipes are original and innovative. They use uncommon fruits and vegetables as well and have a variety of ingredients that make the concoctions truly titillating. The book has separate information on ingredients used and techniques and equipment required. It is a visually appealing book with excellent photographs accompanying each of the 101 recipes selected from the author’s huge repertoire. 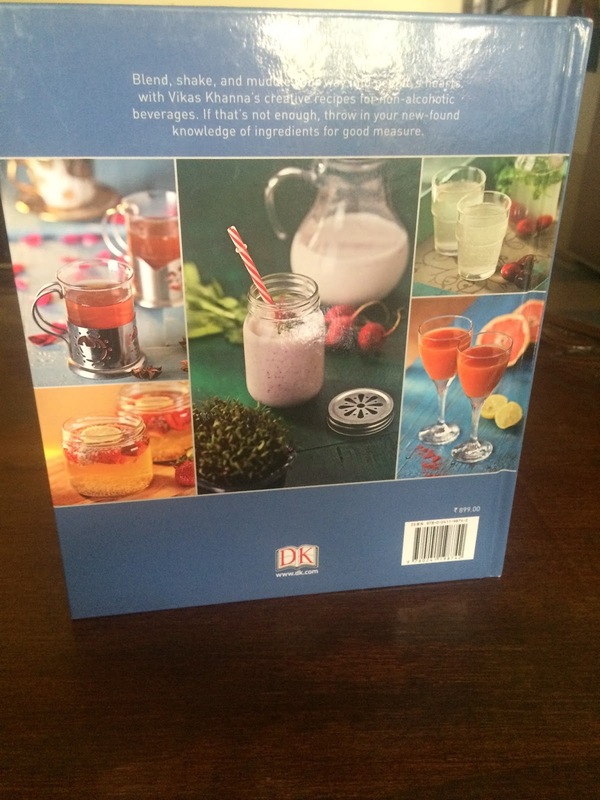 It also packs loads of information on making the drinks which have interesting flavours. For example, star anise has been used in mint iced tea. Sandalwood and basil seeds have been infused with lime juice and pomegranate juice and mixed with jaggery and coriander sherbet. 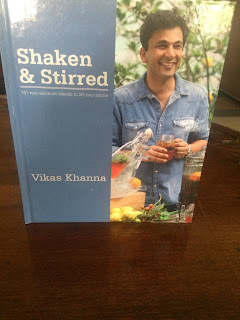 Vikas Khanna has even used the recipes of roadside vendors selling ‘Jal Jeera’ and ‘Nimboo Pani’ for creating new flavours in his book. It is always relaxing to create magic in one’s kitchen or bar and also on one’s palate. The drinks are not very heavy on the purse. Its effects are verily uplifting and ideal for the Indian summer. Besides an interesting introduction, the book has 10 categories of recipes in ten chapters with meaningful names such as Refresh, On the go, Soothe, Revive, Savour, Chill, Restrain,Trick and Treat, Inspire and Raise a Toast. There is a chapter on techniques and equipment and an index on recipes. “One of the most important aspects of anything we eat or drink is pleasure. We are bombarded with scents and flavours every day. These experiences can be stored with surprising vividness for a very long time. We all have childhood memories of our ultimate comfort drinks. Some kids wake up to the smell of coffee and for some it’s a fruity, juicy morning. For me it was warm milk scented with cardamom, sometimes garnished with almond slivers. I spent most of my childhood experiencing flavours and tastes of foods and drinks from around India. The nostalgia of perfumed cardamom chai in a clay pot, steaming my nostrils, and the kokum-flavoured coconut milk served before a lavish spread of south Indian delicacies still lingers on. I learnt how to combine the woody flavour of cumin with the liquorice taste of star anise or cool mint with lemony coriander. I remember creating a thick jam in Kashmir, using the sweet-tart flavours of cherries and combining them with the slightly liquorice flavour of fennel seeds. Inspired, I embarked on a quest to collect and catalogue as many flavours and scents from foreign cultures as possible. This collection of drinks is a fruition of all those experiences and insights”, says Vikas Khanna. The above sums up the author’s passion behind the book. He is truly an authority on eclectic cuisine and non-alcololic drinks and an epicurean’s delight. Vikas Khanna has risen from humble beginnings. He used to sell ‘chholey-bhature’ and ‘paneer pakodas’ in the streets of Amritsar. When he was a seven-year-old, his grandmother used to take him to the Golden Temple to make breads. Then in 1990 at the age of 19, he started his own eatery with just Rs.8000 which his mother and he earned by selling sweaters in a school. With that money he bought 24 chairs, 23 plates, two small frying pans and one tandoor. He always dreamt of opening one of the biggest restaurants in the world. He fulfilled his dream when he set up his restaurant in New York called ‘Junoon’. There are some unknown aspects of the author’s personality. He is a great lover of poetry. He reveres the famous Urdu poet Ghalib. and calls himself a great fan of Ghalib Saheb. He even recites Ghalib’s kalam.There is yet more to Vikas Khanna than Ghalib and international food and non-spirit drinks. He is a very down to earth man and has extraordinary knowledge on Indian spices . Vikas Khanna has also authored a book titled Utsav. It is a 1200-page tome. It is priced at a staggering Rs eight lakhs. “This is going to be one of the world’s most expensive books. It’s an exclusive book. I just want the world to know that Indian food matters and Indian cuisine is the mother of all cuisines.” He is also planning a book on 100 varieties of rice available across the world. Allow me to let you all into a few secrets. I have decided to 1) give my grandaughters a terrific surprise when they come home next with ‘Cindrella’s Chocolate’, 2) to my daughter, a foodie, ‘Sandalwood and Basil Seeds on the Rocks’, 3) to my wife, a great lover of dogs, ‘Cherry,Cherry Everywhere’ (Cherry is our pet dog’s name) and to my son-in-law a great connoisseur of drinks, ‘Goji Berry Shakeratto’. I will treat myself with ‘God’s Own Drink’. To whom should I gift a copy of this book? It is a no-brainer .To my son-in-law of course. In addition to his Stanford MBA and a fabulous job in Mumbai, he is a qualified bartender from the State of California. I will now be assured of my favourite non-alcoholic drinks when I visit him and his family. All of you too will drool over the eye-catching names and go bonkers over the drinks. Shake it or Stir it, you will love it anyways. Benevolence is an act of kindness or a desire to be kind. It's the quality of someone who volunteers in a freemeals service centre, teaches children for free and helps senior citzens cross the street. Nearer home, helping your grandmother with her provisions for the kitchen is an act of benevolence — as long as it is ‘gratis’. Giving your little brother or sister the last helping of an ice cream cone or bar of chocolate shows benevolence. Benevolence is any kind act, but it can also describe the inclination to do good things. If you think of yourself only, it is unlikely that you will be benevolent. But if you can change that attitude and think of doing good to others besides yourself you are a benevolent person. You must also have a social conscience. You can then help towards transforming your society, your nation and the world at large. This is what the author conveys in this book. The author Sri A R Chandrasekar raises a very critical question through the title of this unique and remarkable book. And answers the question he raises in its 259 pages. He highlights the importance of doing good to others and at the same time of taking care of one’s self. The two have to go hand in hand for the benevolence movement to be sustainable. We cannot have islands of prosperity for long when the majority of the world population is poor. Maximum wealth is concentrated in the hands of 10% of the worlds’s population. More than 3 billion people live around poverty line conditions.We see that the rich are getting richer and the poor are getting poorer. The excess money flow to the rich has to be restricted. How long can this societal imbalance continue? Surely, not for long. Strife, disputes, rebellions, wars are all fought for dominance of one group over another. The rich consume disproportionate percentage of natural resources in comparison to the poor. Like individuals, this applies to nations as well. Natural resources are depleting and a time will come when the natural resources will get completely exhausted. We have to arrest this situation and make our society, our nation and the world at large a safe and happy place to live in. Selfishness, greed, etc must be replaced by kindness, caring, sharing, and love. Current societies must change from being consumption-driven to care and love-driven. The young and the old who are both vulnerable sections of societies must be protected and made to live happily. The young have to be nurtured with the right thoughts and the old insulated from disease, loneliness and deprivation. People must live connected and care for one another. The author is 79 years old but his age has not diminished his passion to correct this societal imbalance. He formed a Trust in 2012 to covert his passion into a mission. Thus was born the ‘Mission Benevolence’ at Bengaluru. The book has ten chapters. After describing the idea behind writing the book in the first chapter, in the next six chapters (pages 15 to 104), which is almost half the book, the author dwells on what benevolence means, why we should make it our choice, the need to create and develop benevolent people and societies around us, how emotions can be handled benevolently and the idea of benevolence in love, marriage and family life. 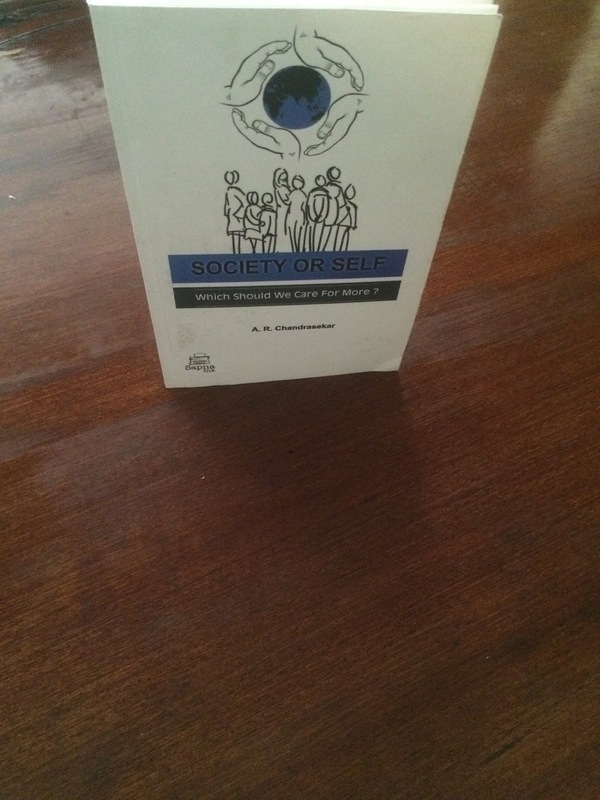 The last three chapters are devoted to the idea of personal wealth, income inequalities, the need for generating social consciousness required for benevolence and volunteering and what needs to be done to correct the income imbalance and inequality and eliminate the destruction of scarce natural resources and improve sustainability of the planet earth for future generations. We need good governance and it requires continuous monitoring by the people as well says the author. Further, India has an unrivalled youth demographic: 65% of its population is 35 or under, and half the country's population of 1.25 billion people is under 25 years of age. The youth of the country must be developed to ensure well-being and prosperity of our country. While reading this book, I was reminded of a similar movement called TZM (The Zeitgeist Movement) which was founded in 2008. According to the founders of this movement,the evils of modern society have come about because of disproportionate accumulation of resources in the rich countries and the financial enslavement of the poorer countires which remain deeply in debt. It gives a clarion call to come out of these shackles and build a sustainable world of goodwill,trust,love and caring with due repect to nature and the environment. The Zeitgeist Movement has no allegiance to any country or traditional political platforms. It views the world as a single system and the human species as a single family (vasudhaiva kutumbakam). It recognizes that all countries must disarm and learn to share resources and ideas if we expect to survive in the long run. The book is very readable and written in a cogent style. The author gives many a illustrations for building benevolent people and societies, developing social consciousness and improving sustainability. The youth in particular will greatly benefit by reading this book. Lt Col. Athavale served the Indian Army for 34 years before he took up a second innings after retirement. He decided to study the science of ageing and put the knowledge that he gained into practice for the benefit of all senior citizens. For more than two decades, he has been working for the cause of the elderly. He is a member of many associations connected with Ageing and the welfare of senior citizens. Elderly people in India as elsewhere in the world face complex health issues and financial problems besides familial pressures, loneliness and physical and emotional abuse. In our country, there is a large rural population of senior citizens both men and women for whom many of the benefits and conveniences available to the urban population are sadly missing. Importantly, access to emergency health services and opportunities for second career are not available to them thus compounding their problems which makes them financially and emotionally very vulnerable. The author is of the view that the age range between 60 and 80 is the golden period of a person’s life. The author’s interactions with this age group in his hometown Pune and his study of gerontology and the many research studies conducted by him have convinced him that the sunset years need not necessarily be gloomy and traumatic. This is the message he has been trying to spread to the increasing number of senior citizens in his hometown and elsewhere. The book has two parts. The first part explains the meaning of Gerontology (Study of old people). It is the study of the social, psychological, cognitive, and biological aspects of aging. This subject has not yet got the prominence it deserves in the field of education and in medical care. Research on Gerontology which is significant in developed Western countries is minimal in India where the demography is rapidly changing with an expected senior citizens’ population of 320 million by 2047 from about 100 million currently. In this section, the author writes on some of the research done locally on gerontology, the status of senior citizens of India with respect to other developed countries and the role of senior citizens in society. He espouses the need for a strong Senior Citizens’ movement to bring about rapid changes in legislation and Government policy leading to betterment in the life of the elderly and an Action Plan on Ageing in line with our age-old culture. The elderly, says the author, are valuable human resources and their strengths and experiences must be leveraged effectively for common good. The author gives many examples of how most people are unprepared to face the sunset period and that by proper long term planning, attention to finances, maintaining good health, remaining socially active and pursuing studies on new subjects and doing social work, a phenomenal change can be brought about in one’s life which is bound to make the post-retirement period productive, successful and satisfying. 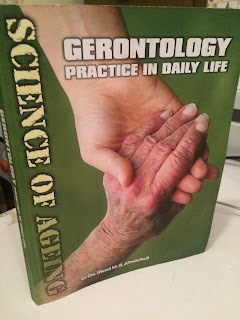 The second part of the book is about converting gerontological knowledge into daily life usage consistent with our lifestyle, ethos and culture. Long term planning encompasses health planning (physical and mental health), emotional, spiritual and social health, financial planning, choosing the location where one wishes to retire, and importantly covering oneself with medical insurance. The author has given practical suggestions for effectively handling security issues, loneliness and elderly abuse. There is a full chapter devoted to “Wills” and the concept of the “living will” and another on “Day Care Facility”. Geriatrics which focuses on health care of elderly people and aims to promote health by preventing and treating diseases and disabilities in older adults seems to be getting more attention than gerontology. While gerontology is a social issue, geriatrics has commercial overtones. Both are vital for productive and successful ageing and deserve equal importance and consideration. The book has an attractive cover page and may members of the author’s family have contributed to the overall excellence of the book. The author has provided a great deal of statistics on the elderly population and the demographic changes that are taking place. 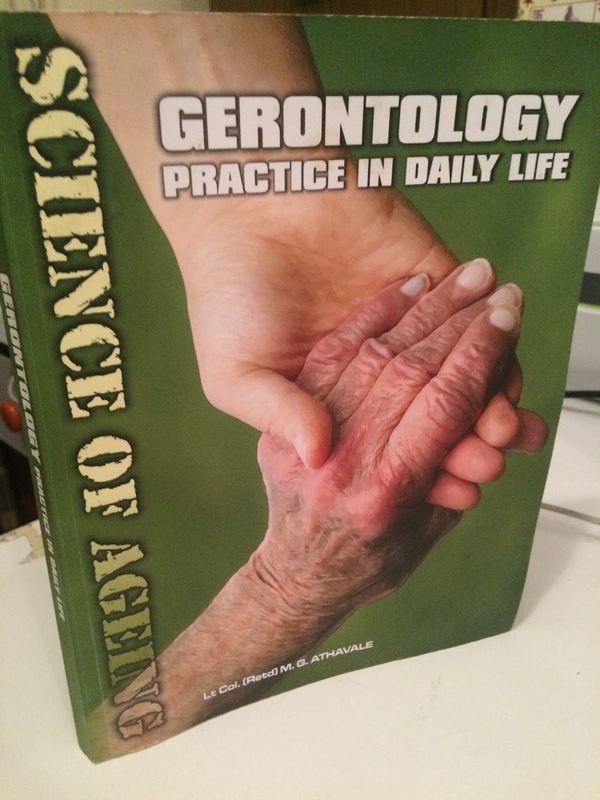 This would be of particular interest to students of gerontology and those who are doing research on this subject. Though the book will have a niche audience as it addresses the problems of a particular age group, it should be of equal if not more appeal to those who are in the threshold of retirement and those who want to be part of a Senior Citizens movement. Policymakers at the Centre and State levels would also benefit from reading this book and they will hopefully initiate policies for the betterment of senior citizens who are an ignored set of people today. The red lights are flashing and the alarmbells are ringing. The author highlights the plight of the elderly with facts and figures and draws attention to the powers that may be to take the warning seriously. Those policymakers who ignore the writing on the wall will make the country pay heavily in the years to come with unpreparedness for facing a mammoth demographic challenge.